Comfy and convenient perks like microwaves Wi-Fi and a daily breakfast are all included at the Travelodge Orangeburg. Microwaves mini-fridges flat-panel HDTVs and free Wi-Fi come furnished within all 44 rooms at this low-rise Travelodge. Non-smoking rooms are available. Wake up each morning to refuel over complimentary continental breakfast. The hotel also provides a vending machine and free on-site parking. Pets are allowed for an additional fee. 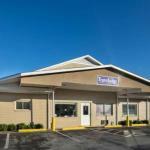 Off I-26 the Travelodge centers guests in a retail/dining-friendly area five miles north of downtown Orangeburg. Grab the little ones for a fun-filled family day at the Palmetto Falls Water Park 44 miles north outside of Columbia. Guests are five miles from shopping at Prince of Orange Mall and the greens of the Hillcrest Golf Course. The hotel is also an easy seven-minute drive from Claflin University and within a five-minute walk of the Regional Medical Center. Columbia Metropolitan Airport is 35 miles northwest.